The Florida Gators just didn’t have enough for the high-powered Ole Miss Rebels offense this weekend. A tough series only got tougher on Saturday as Florida fell 16-4 and 12-10 in Saturday’s doubleheader after an ugly 12-4 loss on Friday. 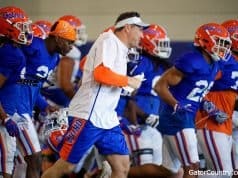 All three games were littered with mistakes by the Gators, and the issues started early in the first game of the day. Tyler Dyson looked poised to get out of the first inning unscathed with a runner on first and two outs, but a four-pitch walk followed by a wild pitch and a high passed ball brought in the first of many Ole Miss runs. After another walk, the Rebels had runners on the corners. The runner on first took off and intentionally got in a pickle (see Little League 101) as catcher Brady Smith took the bait and threw down. Florida got the out, but not before another run came in to make it 2-0. Dyson came back to strike out the side in the second inning and the Gators had a chance to answer the next time up to bat. Cory Acton reached on an error by the second baseman and Jacob Young hit a chopping ground ball to shortstop that he beat out for an infield single. Florida had runners on first and second with one out. Down two and needing runners in scoring position, they chose to gamble and put them in motion for a double steal. Catcher Cooper Johnson hosed Acton at third and a groundout ended the threat. The third inning told more of the same story for the Gators. After a leadoff single, Ryan Olenek popped up to shortstop, but his bat came around and clipped Smith’s wrist on the follow through. That sent Smith to the bench for the rest of the day and Jonah Girand replaced him behind the plate. The Rebels tested him immediately with a steal. Florida knew it was coming, but the pitch out got away from Girand and the runner came all the way around to third. The first of several RBI singles from Grae Kessinger (who went 5-for-5 in the game) made it 3-0. At that point, both teams had three hits, but Ole Miss had the advantage on the scoreboard. The Gators scored in the top of the fourth inning after Jud Fabian lined it up the middle to plate Nelson Maldonado, who led off with a double. Again, Florida just couldn’t hang onto any momentum it gained. As it took a step forward, it took another two steps back, giving up two runs to Ole Miss in the bottom of the inning. Dyson’s day ended after 3.2 innings of work. He gave up four hits and five runs, but none of them were earned. Then entered Hunter Ruth, who Kevin O’Sullivan left out to be eaten alive over the next 2.1 innings. An eight hit, six run fifth inning by the Rebels busted it open to 11-1. It continued into two more runs in the sixth, but Fabian stopped the bleeding with a beautiful play running into the wall for a catch in center field. Kirby McMullen replaced Ruth in the seventh, but the Rebels continued to get hit after hit until it was 16-1. 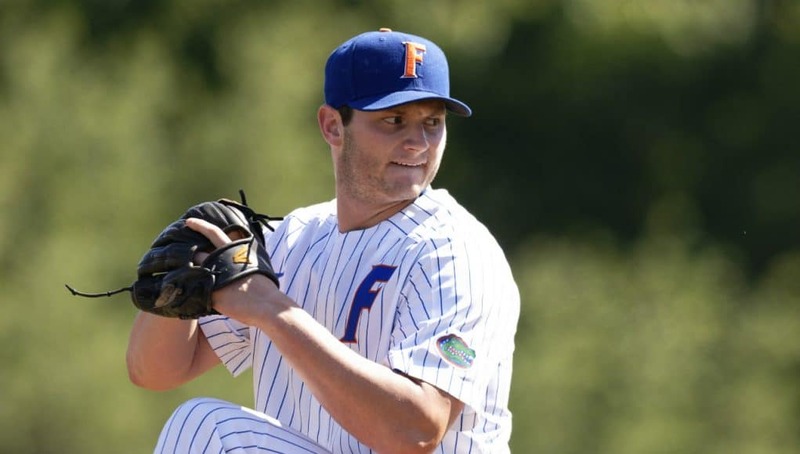 The Gators did find some positives at the plate in the eighth inning. By that point, it was far too late to make a comeback, but they could at least carry some momentum into the following game. A pair of pinch hitters in Kris Armstrong and Jordan Butler reached with a double and an infield single. Then, Wil Dalton and Austin Langworthy drove them in with a couple more extra base hits. It might not have been much, but Florida did seem to come out more confident in Game 3. O’Sullivan made some changes to the lineup, rewarding Armstrong with the start at third base and putting Santino Miozzi behind the plate. Freshman pitcher Christian Scott took the mound in place of typical starter Jack Leftwich. And Scott made the most of his opportunity. He sat the Rebels down 1-2-3 in each of the first two innings, something Florida’s pitchers hadn’t been able to do much throughout the weekend. The Gators got a chance to take an early lead in the second inning with back-to-back singles from Kendrick Calilao and Langworthy, but the three straight strikeouts that followed pretty much explained Florida’s series to that point. Then, in the third inning, Brady McConnell laid down the perfect bunt for a hit down the third base line with one out. Acton doubled just out of reach of the diving right fielder, putting runners on second and third. Maldonado had a chance to bring them in, but popped it up to shallow right field, not deep enough for a sacrifice fly. Calilao picked him up with a hard hit past the third baseman (ruled an error) that brought in those two runs. Starting pitcher Houston Roth was rattled and started losing control with four straight balls to Langworthy. He hit Dalton with the next pitch to load the bases, and Fabian knocked a single to left field for a pair of RBI, giving the Gators a 4-0 lead. Scott got in his first jam in the bottom of the inning, but stayed cool to get a big strikeout with bases loaded and a full count on the batter. The Gators doubled their score in the fourth inning. It started almost the same way, with McConnell singling and Acton dropping a fly ball in no man’s land for his second double of the game. A bases loaded walk by Calilao, a sacrifice fly from Langworthy and a double by Dalton down the left field line kept the runs coming in until it was 8-0. The Ole Miss bats weren’t going to stay quiet forever, and Cole Zabowski got two of those runs back with a home run in the bottom of the inning. With bad weather approaching the area, a delay was eminent. The Gators needed three quick outs in the bottom of the fifth to make the game official, but instead they gave up three straight singles. By time that delay rolled around, the Rebels had cut it to 8-3 and were heating up. An hour break did nothing to slow that down. Nolan Crisp took over a 3-1 count on Tyler Keenan started by Scott. A first pitch ball loaded the bases, still with no outs. Crisp just didn’t have it on Saturday night. A walk, and another walk, and a double and a couple singles later, the Rebels had nearly batted around twice and put up an eight-spot. Florida managed to go from an 8-0 lead to giving up 10 unanswered runs. It did have a nice answer in the sixth inning with a home run off the bat of Maldonado. Calilao followed him up with a single, then Langworthy tried to take back the lead in one swing of the bat, but his deep fly ball hit just off the top of the wall in right field. Calilao only made it to third on the hit, but he came in on a wild pitch and tied it 10-10. Despite a very poor fifth inning, Crisp remained in the game. He gave up two singles to put runners on the corners and the umpire called him for a balk. The very close call sent the runner home. Still out there for the seventh, Crisp allowed a leadoff triple to Austin Servideo before being replaced by Nick Pogue. Once again, it didn’t matter who was on the mound as a crippled Ryan Olenek drove a double to left center to go up 12-10. The Gators had a chance with two free passes earned by Acton and Calilao in the eighth, but they couldn’t bring them in. 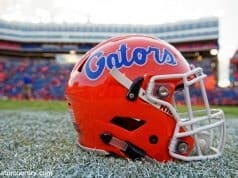 And a three up, three down ninth inning ended the weekend Florida wants to put in the rearview as quickly as possible. Giving up 40 runs, 49 hits and making costly mistakes over the course of three games is going to end in getting swept almost every time. 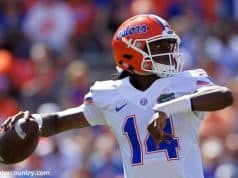 Florida’s struggles on the road continue, but it will have a chance to get back on track as it returns to Gainesville to face South Carolina next weekend.